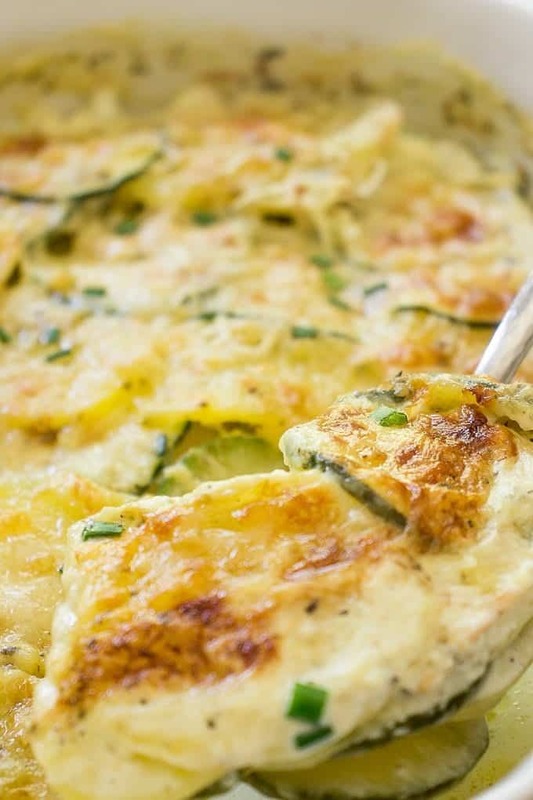 Rich, creamy, flavorful, cheesy and so satisfying, this Potato and Zucchini Gratin is an ultimate comfort food side dish for any type of meal or occasion. Very easy to make and so delicious! One of my favorite way to use zucchini is to transform it into a gratin. A few years ago I’ve shared with you my foolproof Eggplant Gratin that is still in top of my best performing posts. Today’s recipe is another winning dish. After trying it once, my husband couldn’t stop complimenting me. It was that good. The secret to my Baked Potatoes And Zucchini is a simple sauce made with cream, garlic, herbs de Provence and a sprinkle of Gruyere cheese. This garlic enriched sauce penetrates the vegetables making them flavorful, soft and luscious. 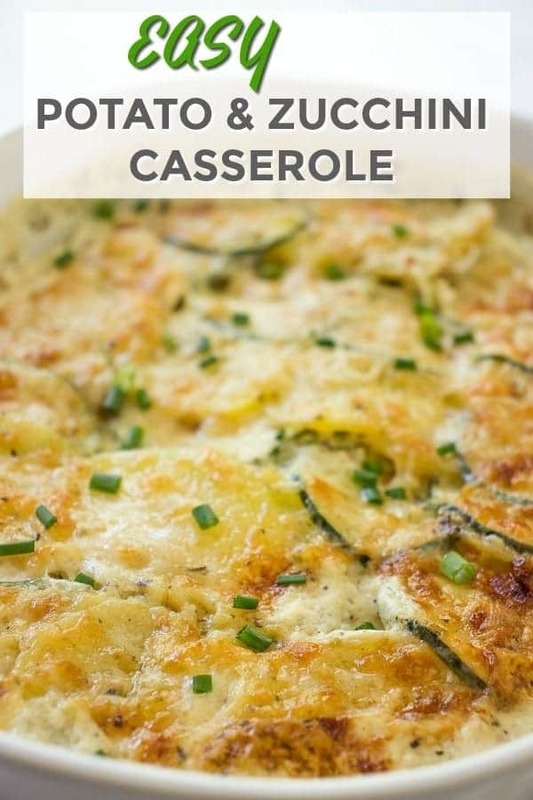 And just like my Cauliflower Gratin or creamy Chicken Gratin which is one of my recently discovered comfort foods, this Potato and Zucchini Gratin will also fill your kitchen with warm and comforting flavors. And one thing you can be sure of. Once you try my scrumptious Potato And Zucchini Casserole , you’re gonna want seconds. Imagine the side dish that goes with everything. 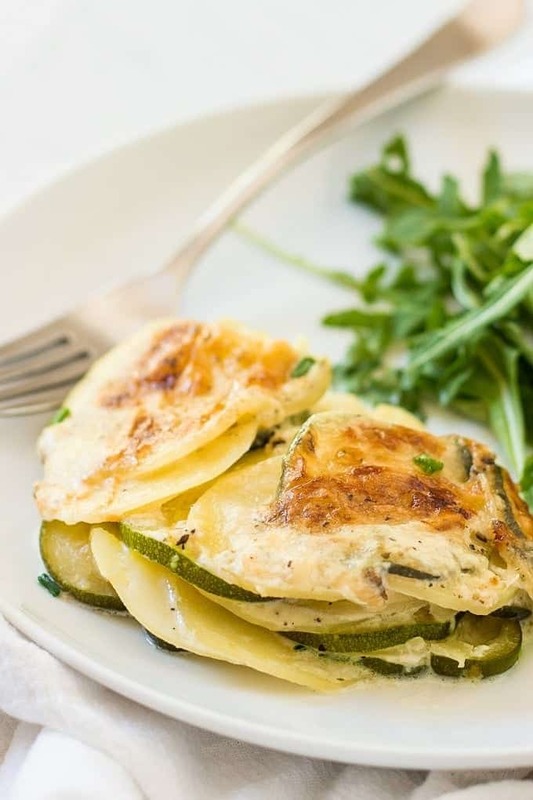 This Potato And Zucchini Gratin is the recipe that pairs great with meat, fish and can also be prepared ahead for the potlucks. 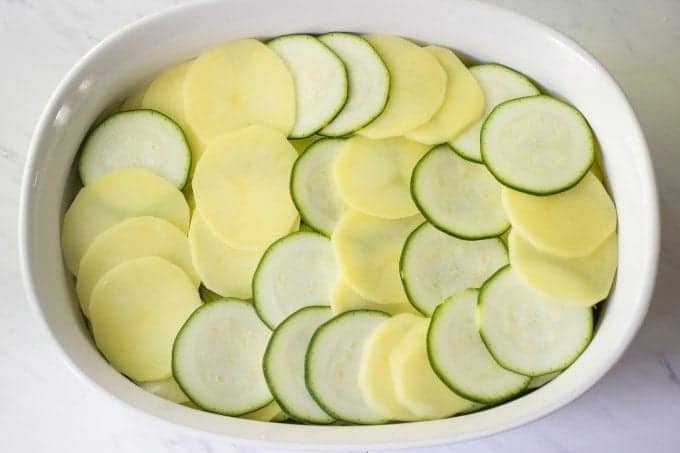 The zucchini potato recipe takes minutes to put together which is especially handy during holidays when you need to prepare lots of food but don’t wish to spend the whole day in the kitchen. For this recipe I used 5 smaller potatoes and about 1 1/2 zucchini. You can slice them with a knife but for the even slices I recommend a mandolin. Slice the potatoes into 1/8 inch slices and zucchini into 1/4 inch slices. Grease 8 x 6 baking dish and arrange sliced vegetables in a circular pattern in a dish, overlapping slightly. 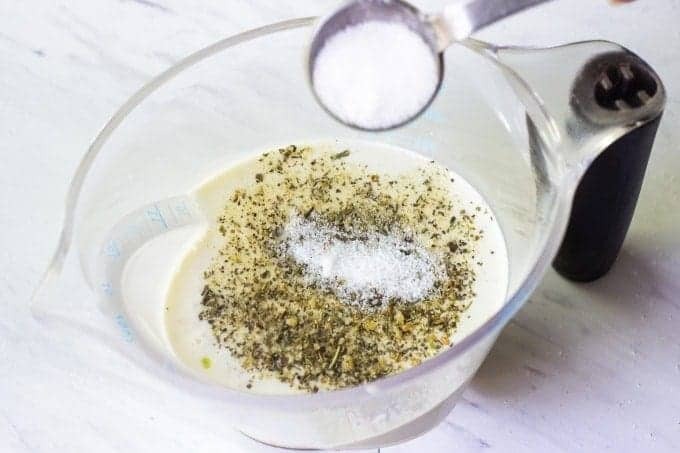 In a tall measuring glass combine half and half (you can also use cream if you like), herbs de Provence, salt, pepper and garlic pushed through a garlic press. Give everything a nice whisk. Pour sauce over the vegetables. Sprinkle with grated Gruyere or Parmesan cheese. For these types of recipes I prefer using Gruyere as it melts nicely and has a beautiful nutty and earthy flavor. Now all you have to do is cover the dish with a foil, pop it in the oven and bake for 40 minutes and then remove the foil and bake for 10 more minutes. 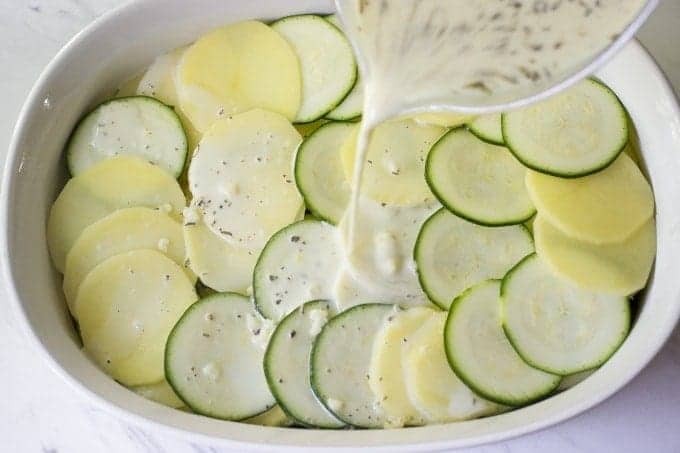 If you plan to make Potato And Zucchini Gratin for the holidays table, you can arrange everything in the baking dish in the morning, cover with a foil and refrigerate for a few hours or until you’re ready to bake it. 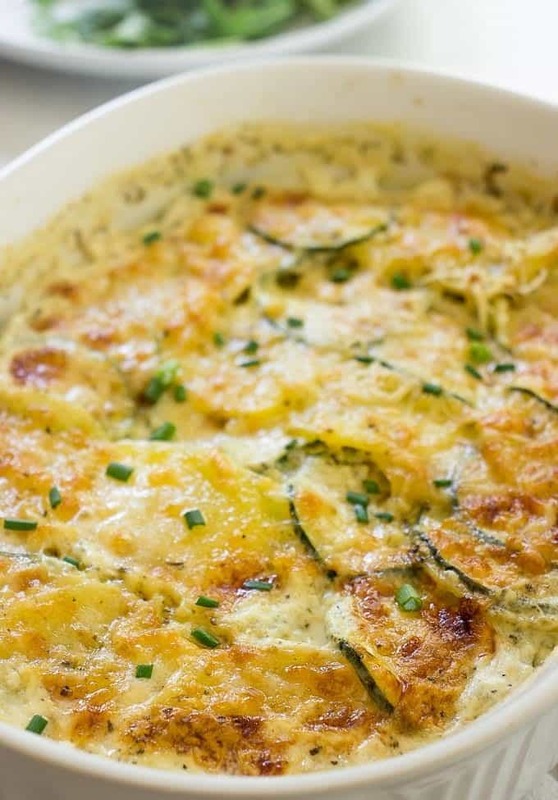 Rich, creamy, flavorful, cheesy and so satisfying, this POTATO AND ZUCCHINI GRATIN is an ultimate potato side dish for any type of meal or occasion. 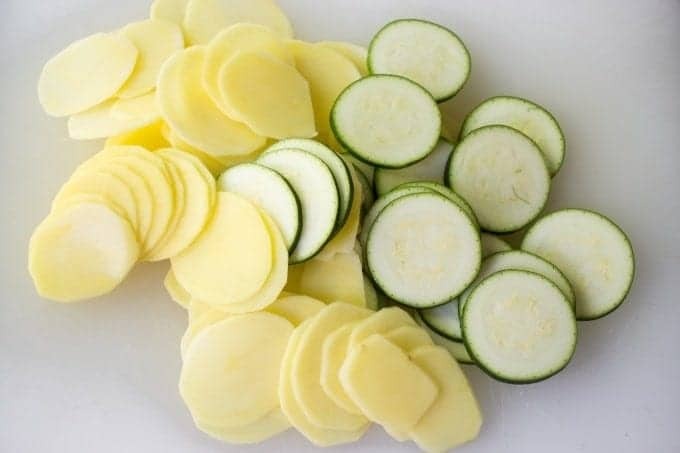 Using a mandolin or a sharp knife, thinly slice the potatoes into 1/8 inch slices and zucchini into 1/4 inch slices. In a measuring glass combine half and half, herbs de Provence, salt, pepper and garlic. Give everything a whisk. 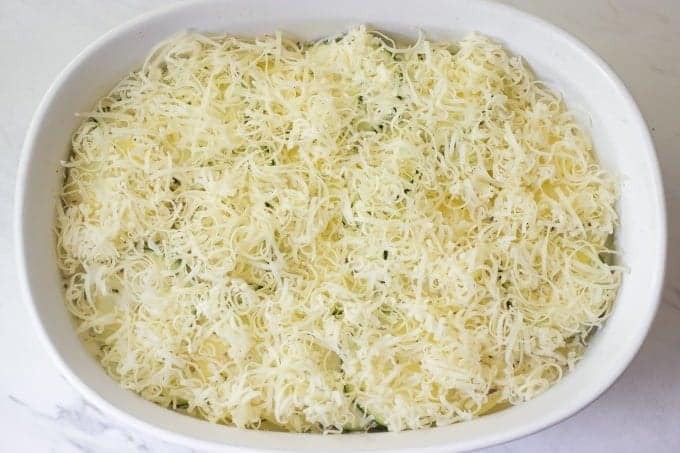 Sprinkle gratin with grated Gruyere cheese. Cover the dish with a foil, pop it in the oven and bake for 40 minutes. Carefully remove the foil and continue baking for 10 more minutes. What’s your favorite potato and zucchini recipe? Let me know in the comment section below. If you make my Zucchini And Potato Gratin, snap a picture and post it on Instagram with a hashtag #lavenderandmacarons. Eleni, thank you for your feedback! Sorry the recipe wasn’t to your liking. I might give it a go again to see if anything needs tweaking. 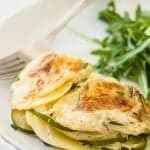 Aside from that this Potato Zucchini Gratin is a recipe that I love and it always turned out great whenever I made it. I appreciate you sharing the feedback anyway! This looks so delicious and easy, Can’t to try this with my next Sunday roast dinner! oh man I saw this on instagram today!! so this is the SECOND time you’re making my mouth water so bad with this delicious dish!!! I seriously adore this!! I want to put it on my weekly menu for next week! Thank you Camila! I hope you’ll like it! This looks like such a tasty way to use up zucchini! Absolutely. Zucchini pair so well with potatoes. Adore zucchini! In any form. I love potato gratin. I cannot wait to try this!